is my new home – I moved here at the end of December with my family. I’m super excited to start painting this beautiful city and some cold wintery landscapes! I’m so lucky to have the eminent Dr Sasha Grishin follow my career, right from one of my earliest exhibitions Of Landscape and Memory, which he reviewed in 2000. On Friday Dr Grishin reviewed Lowlands in glowing terms, in a piece titled ‘Putting a touch of magic into everyday reality‘, in the Canberra Times that opened with ‘she creates gem-like tableaux, which shimmer on the gallery walls’. The mention of Clarice Beckett and the ‘European tradition of the sublime’ is high praise indeed, and greatly appreciated. I’m super pleased that the opening of my exhibition ‘lowlands‘ went really well – the works were finally all together on the wall and I could take a step back on my activities over the last 6 months. It was also lovely to see some old friends and feel that Canberra art community support. Back in April I was super lucky to be in the midst of six amazing Adelaide artists at the Gate 8 Workshop, when I undertook a short residency in their loft space – a desk and time and space to myself to develop new work for my forthcoming exhibition in September at Beaver Galleries, Canberra. I managed to get a whole lot of new paintings underway and a renewed excitement for the next body of work. stay tuned for images soon.. The M Collection celebrated 10 years of collecting with an exhibition at Menzies Art Brands, South Yarra In Melbourne. On display was a diverse and outstanding collection of work selected by the 10 members of the M Collection, who have been rotating the works in their homes every 6 months since 2008. 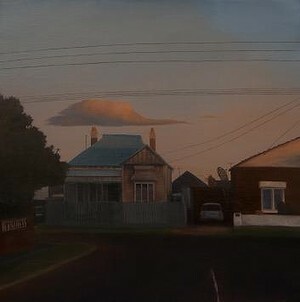 Two of my paintings were included – Glenmorgahn, Brunswick East 2013 and The Gloaming 2013. Thanks to Templeton Architecture and Gallerysmith for featuring one of my paintings in a recent photo shoot for a project in Toorak, Melbourne. I’m really happy (and relieved) to report that the show was a success and I was delighted to receive a lot of positive comments about the work. Not many paintings remain in stock – brilliant incentive to get back into the studio! This article, slightly different from the Diamond Valley Leader, was the result of a phone interview about the show. Unfortunately Sim couldn’t join me for the photo shoot. Today’s Diamond Valley Leader has an article on the show! Our exhibition ‘Keepsake’ opened at Bundoora Homestead on Saturday – thanks to everyone who came along. There was a great atmosphere, with 8 other exhibitions opening that day and a fantastic opening speech by Emma Busowsky Cox. Sim Luttin and I gave an artist talk about the works, the materials, the exhibition process and how we’d like to continue to have shows together – watch this space! I’ll be updating new works in the artworks section of this site as they develop..stay tuned! Landmarks was opened on the 25 August with a beautiful speech by Kelly Gellatly, Director, Ian Potter Museum of Art. I’m so happy to be included in this show. I’ll post some more images of it all soon..
My family and I have moved to Belgium for a year. I plan to soak up some Flemish art and see how this northern light influences my paintings..I’ll keep you posted.. Although most Australians live in the suburbs, Australian artists have generally been a little shy of this subject. There have been notable exceptions, for example, the early works of John Brack and the art of Howard Arkley, but these hardly constitute a major tradition in Australian art, as do the landscape, the outback or still life compositions. Kirrily Hammond, now a Melbourne-based artist but until about a decade ago living in Canberra, is fundamentally a printmaker with a romantic predisposition. Her images are moody, frequently set at dusk, and often touched by the sense of awe and embracing the sublime in nature. She has now brought this sensibility to the streetscapes of her adopted city of Melbourne and its tightly packed inner northern suburbs. In terms of their sense of presence, her work brings to mind those melting tonal visions of Clarice Beckett and her watery images of dawn and dusk in her particular patch of Melbourne, the suburb of Beaumaris. Except I find something slightly menacing about Hammond’s vision of Melbourne suburbia, particularly the suburb of Brunswick, from which come virtually all of the small oil paintings and charcoal drawings in this exhibition. The paintings Laneway, Brunswick East, Bladen Ave, Brunswick East, Canberra St, Brunswick and the drawing Street signs, Brunswick East, all imply an exactitude of location through their titles, yet appear to be devoid of human inhabitants. There is an anonymity in this suburbia, where danger is not depicted, but seems to lurk somewhere behind the facades of suburban houses. It was in Brunswick that the 29-year-old Jill Meagher was brutally raped and murdered in 2012, an incident which deeply scarred the whole Brunswick community. 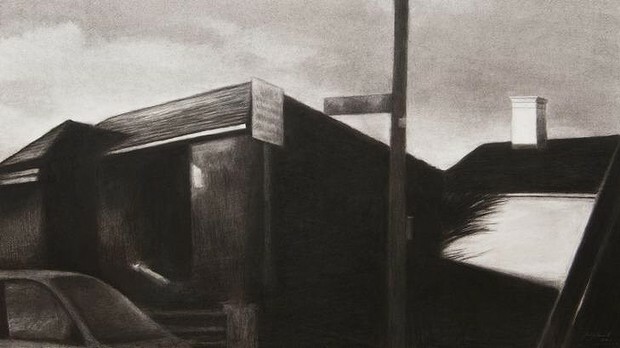 There is nothing in Hammond’s quiet observations of suburbia at dusk that would link them to these horrific events, but it is a slightly menacing and foreboding atmosphere that pervades in many of the scenes. For me the most successful work at this exhibition is the monochrome drawing Street Signs, Brunswick East. The signs themselves are left deliberately illegible, the facade of the house is thickly veiled in shadows, while the framing foreground space is dominated by a number of fleeting reflections. Although there is a simplicity in the general compositional structure, the notion of ambiguity gives that slightly unnerving note to the drawing. As far as the viewer knows, nothing bad has ever happened here, but the note of foreboding suggests invisible evil forces at play in the air. As with most of Hammond’s exhibitions, this one is quite small, only a dozen pieces, tightly united thematically, but possessing the quality of “otherness”. Looking forward to putting the exhibition up in Canberra this week, it will be nice to be under those clear Canberra skies again. I have some new work in an forthcoming exhibition titled ‘Suburbia‘ at Beaver Galleries, Canberra, opening on Thursday 6 November, 6-8pm. Please come along if you’re in the area. Two of my paintings held in the Latrobe Regional Gallery Collection are currently on display in a group show that explores the ‘darker side’..